DxOMark Sensor analysis clearly shows that the new GH1 sensor is different and actually performance has increased dramatically: a 63.6 DxOMark Sensor score for the GH1, versus 53 for the G1, about a 2/3-stop gain (a 1-stop gain is equivalent to 15 DxOMark Sensor points). Compared to other four-thirds sensors, the Panasonic DMC GH1 is the best performer of those currently evaluated in DxOMark Sensor, especially in terms of dynamic range. The GH1 even outperforms a hypothetical four-thirds sensor cut from a (wider) Canon EOS 7D sensor (with the same pixel size). With its 50% larger sensor surface (corresponding to 9 DxOMark Sensor points), one would expect the 7D to have outperformed the GH1 by 9 points. Instead, it achieves a DxOMark score of 64.9 — only slightly more than 1 point above the GH1’s score of 63.6. Except for the Olympus E410 and Olympus E510 (both released in early 2007), which have a DxOMark Sensor score of about 50, most four-thirds sensors have a DxOMark Sensor score of about 55. The GH1 outperforms them all with a DxOMark Sensor score of 63.6. The GH1 outperforms other four-third sensors in terms of Low-Light ISO (772 for the GH1 vs 571 for the Olympus E3, the second-best performer) and Dynamic Range (11.6 for the GH1 vs 10.8 for the Panasonic DMC L10, second-best performer). The Canon EOS 7D uses pixels of 4.29 µm vs 4.31 µm for both the GH1 and G1. To compare the pixel performance (and not the whole sensor), we can compare the performances in “screen” mode. Obviously the Canon 7D’s performance is similar to the G1’s at ISO settings up to 800, and similar to the GH1’s at ISO settings from 3200. The GH1 outperforms the 7D for ISO settings up to 800. 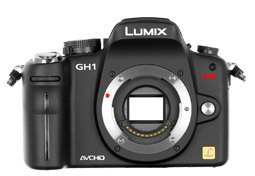 The 7D and GH1 have similar performances, and both outperform the G1 by more than 1 stop. The GH1 outperforms both the G1 and 7D at ISO settings up to 800; over ISO 800, GH1 and 7D performances are similar. Disclaimer:This dxomark review evaluates only the selected camera’s RAW sensor performance metrics (i.e., Color Depth, Dynamic Range, and Low-Light ISO), and should not be construed as a review of the camera’s overall performance, as it does not address such other important criteria as image signal processing, mechanical robustness, ease of use, flexibility, optics, value for money, etc. While RAW sensor performance is critically important, it is not the only factor that should be taken into consideration when choosing a digital camera.